The Ultimate in Puffin chic! The Puffin Scarf! This isn’t just a wonderful piece of Puffinalia and history. It also gives another insight into the character of Kaye Webb. I was recently contacted by a former member of the Puffin staff with a plea for other colleagues to get in touch. I’ve just come across your website and thought you might be interested in the photo I’m attaching! 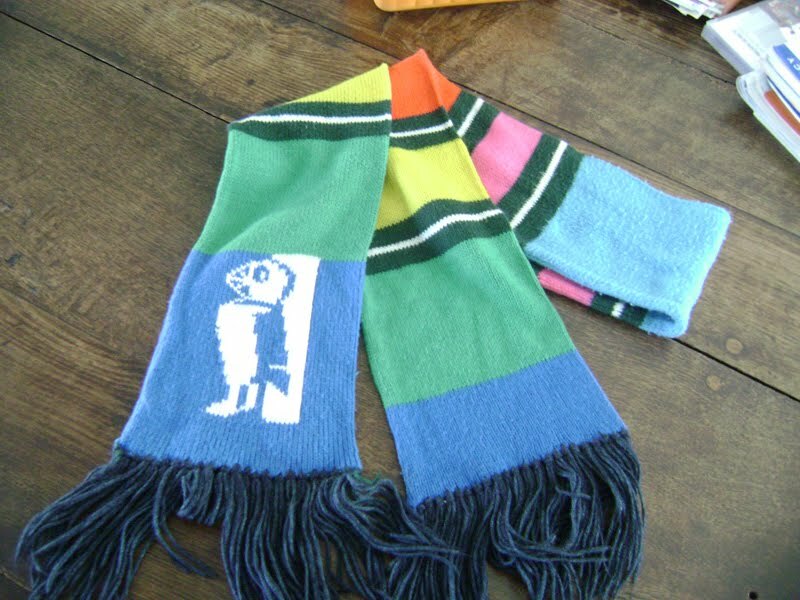 I used to work for Kaye Webb and one year (around 1975) she had these scarves made and given to everyone who worked in Puffins. (As far as I remember, there were around 11 scarves!) I’ve managed to keep – and wear on occasion – mine for all these years and I’d love to know if anyone else still has theirs! Would be grateful for any ideas about how to get in touch with them. If any of you are out there reading the blog, I will be happy to put you all in touch. I am not one of the other puffin workers but I am the great grandson of Jill McDonald and I was wondering if you could give me the posters email address so I can get in touch with them.